Completely redesigned for today’s generation of cooks and food enthusiasts, the 25th Anniversary Edition of Food of Life: Ancient Persian and Modern Iranian Cooking and Ceremonies by Najmieh Batmanglij(Mage; $54.95 640 pages); provides a treasure trove of recipes, along with an immersive cultural experience for those seeking to understand this ancient and timeless cuisine. This edition is a more user-friendly edition of the award-winning and critically acclaimed cookbook series which began in 1986. 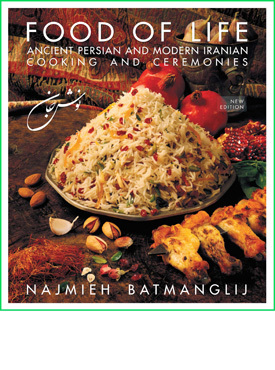 Food of Life provides 330 classical and regional Iranian recipes as well as an introduction to Persian art, history and culture. The book’s hundreds of full color photographs are intertwined with descriptions of ancient and modern Persian ceremonies, poetry, folktales, travelogue excerpts and anecdotes. The 2011 Edition of Food of Life is a labor of love. The book began in exile after the Iranian Revolution of 1979 as a love letter to Batmanglij’s children. Today, as accomplished adults in their own fields, her two sons, Zal and Rostam, encouraged her to redesign the book for their generation. Here’s a demonstration for an easy-to-make baklava recipe from my Food of Life: Ancient Persian and Modern Iranian Cooking and Ceremonies.